For many families, fall is about apples. 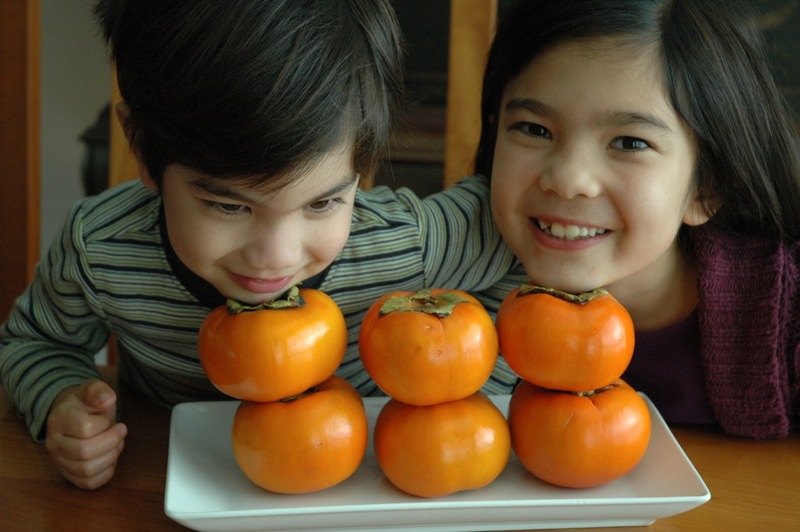 At our house, it’s all about persimmons. Every year, my family eagerly awaits these sweet golden-orange gems. Native to China and Japan, but now grown all over the world, persimmons are harvested between late October and February. Every Halloween, as we carve our pumpkins—the other round, orange fruit in season at the same time—the kids are reminded that their favorite small, crunchy orange fruit is finally here. While my kids have been eating persimmons since they were tiny toddlers, I’m now meeting a lot of folks who have never tried one. If you’re one of those people, your time has come. You have been missing out. There are a number of varieties of persimmons, but the two main ones that are easy to find in the United States are the Fuyu and the Hachiya. Our family usually eats the tomato-shaped, flat-bottomed Fuyus, because they’re easier to find and the less expensive of the two. I also think the kids prefer the Fuyu, because it has a crisp texture, whereas the Hachiya is soft and pudding-like. The Fuyu is ripe when firm, and personally I like it when it has a little give to it, like a ripe peach, but it can be eaten either way and is equally delicious. Although the skin is edible, I recommend that you peel it if you’re a persimmon virgin. Even after eating persimmons for decades I find the skin to detract from the rest of the fruit, which is why I always peel them first. C likes to eat the fruit whole like an apple, and S likes hers in slices. The Hachiya, on the other hand, is an astringent when it’s not ripe, so it’s imperative to let them ripen fully and get really soft. Shaped like a large acorn and characterized by a more reddish-orange hue than the fuyu, Hachiyas are best cut in half and then eaten with a spoon. It’s a shame you can only get these beautiful orange lanterns in late fall and early winter. So, we’re not wasting any time here at the Y household. I’m buying them by the truckloads. The kids are finding them in salads with spinach, goat cheese and walnuts, in their cereal, and in their lunch boxes. If they’re really lucky, I just might try to make a persimmon jam this year. I’m kicking off a new category called “Gotta Try It.” The idea came to me last week when I was at Trader Joe’s with C. I was looking for some just-ripe bananas when C came up to me and shoved a huge stalk of Brussels sprouts into my face. “Can we get this, Mommy?” he asked. 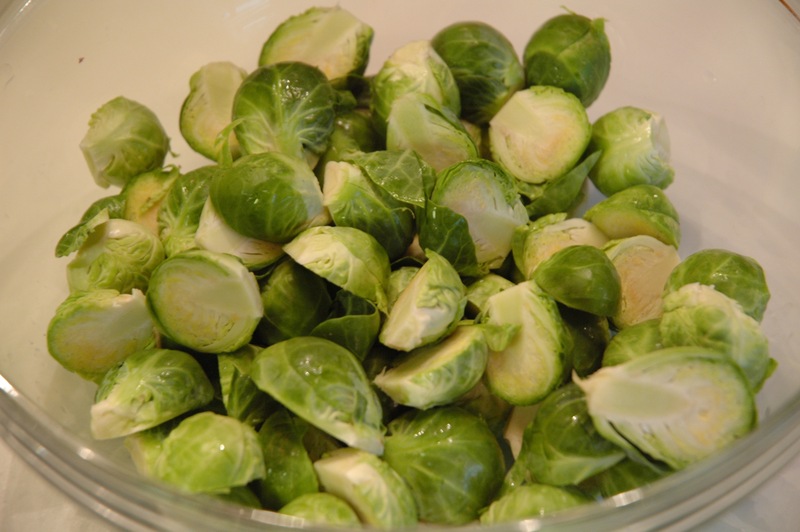 I was taken aback, because he had never eaten Brussels sprouts before. I’ve never made them because admittedly I assumed the kids wouldn’t like them. After all, I have a hard time getting my husband to eat more than a few. So I figured, why bother? “I’ll buy them, if you’ll cook them with me and eat them,” I told C. I’ve always found that if the kids cook a dish with you, they’re more apt to eat it. “Because they’re so pretty,” he answered. Fair enough. They are indeed beautiful on the stalk. I took the Brussels sprouts home, determined to find a recipe that would make even the most finicky eaters a fan of these mini cabbages. 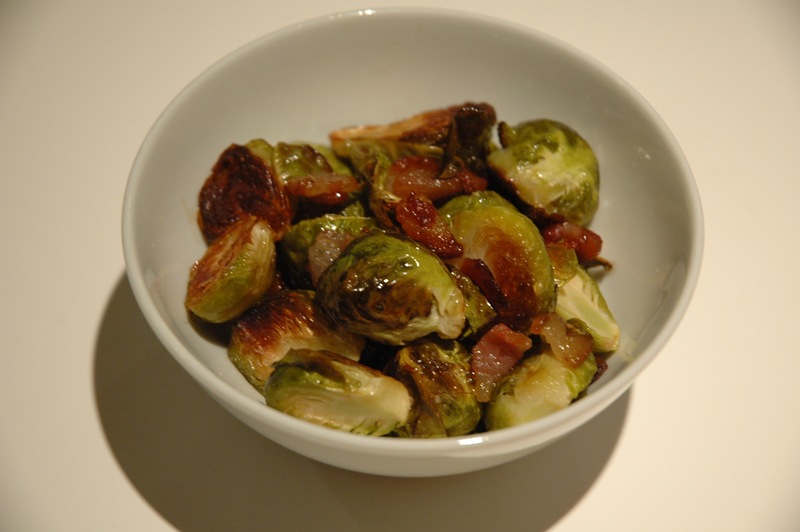 Combing through recipes on the Web, I knew immediately when I found the winning recipe: roasted Brussels sprouts with bacon and maple syrup. What self-respecting human doesn’t like bacon and maple syrup? And nothing says fall like Brussels sprouts, bacon and maple syrup. Together, C and I cut the Brussels sprouts off the stalk, rinsed them and halved each one of them, putting them all in a large bowl. Then, we added three slices of chopped bacon (raw), 2 tablespoons of maple syrup and olive oil, and a pinch of salt. We tossed it all together and then spread it out in a single layer on a baking sheet. 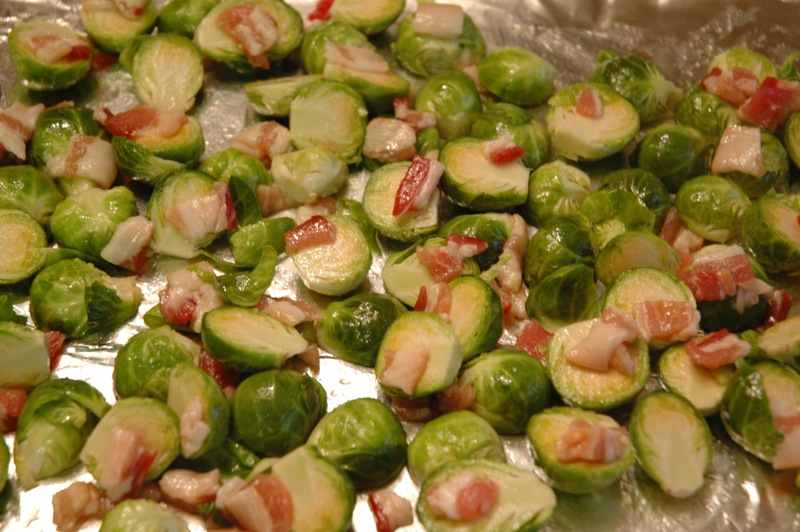 I let it roast in a preheated 400-degree oven for 20 to 25 minutes, turning it a couple times, until the Brussel sprouts were tender and caramelized and the bacon was crisp and golden. The results? Deelish. No doubt it was a “make-again,” as my family likes to say. C loved them and happily popped them in his mouth like popcorn. S was a little hesitant and said they were on the bitter side, but she loved the outer leaves that fell off the sprouts and turned crispy like a chip. Next time, I’m going to add a chopped Granny Smith apple to the mix and maybe a hint of balsamic vinegar. 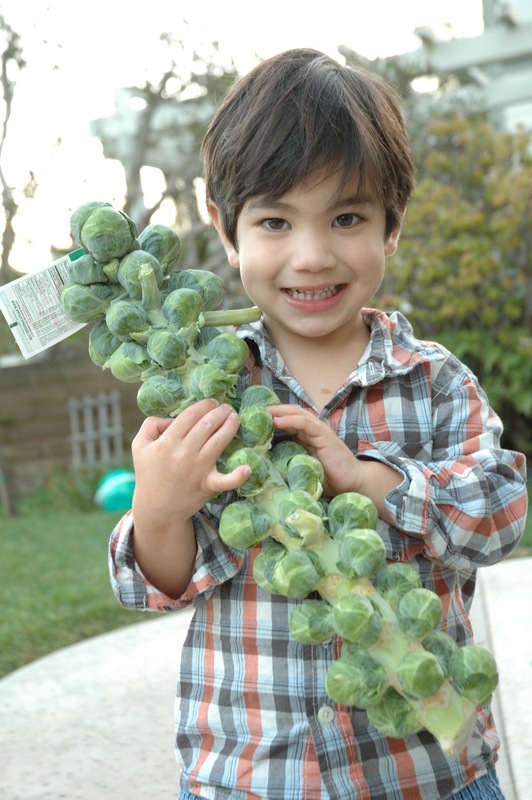 Just think: my son had to ask for Brussels sprouts before I even considered letting him try them. Now, it’s your turn to try this recipe. Go on, already—and report back. By the way, this would make the perfect Thanksgiving side dish.